Users granted with Grade Export System rights will be able to customize the Student Information System (SIS) file that will be used for grade submission. 1. 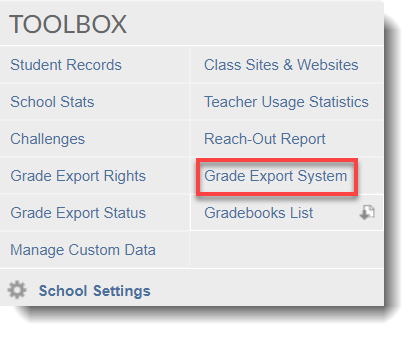 Login to your School Loop account and click Grade Export System in the Toolbox menu. 2. There are three steps to prepare your school to export grades from School Loop to your Student Information System (SIS). For each marking period, you must specify the window of opportunity for teachers to submit grades. Set one marking period at a time or all the marking periods for an entire year. 1. Click the Grade Export Settings under the Toolbox and choose Marking Period Setup. 2. Click the New Marking Period button. Display Name: Use a name familiar to staff. For example, First Quarter Progress Report. Unique Code: Any value will do here as long as each marking period has a unique value. Note: Do not change this code once teachers have submitted grades. The system will consider this a new marking period and submitted grades will no longer be available. If this does happen, changing the code back to the original code will restore the grades. Window Opens: Enter the date and time teachers can begin submitting grades. Window Closes: Enter the date and time teachers will no longer be able to submit grades. Click Submit when finished and then click the Return to Grade Export Setup button. 1. Click the Grade Export Settings under the Toolbox and choose Column Setup. 2. Click the Edit button to set up a column. 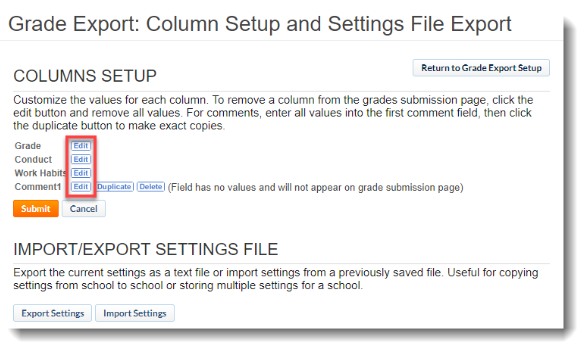 To exclude a column from the grade submission page for teachers, remove all previously entered values. Use the Save Settings File section (Import/Export Settings File) to store all your settings in a downloadable file. This file may be used to quickly configure a site. It’s also useful for schools that change the comments based on the grading period. Name: Value Required: If you wish to require teachers to choose a comment, click the On button. Values (export to SIS): Enter the value required by your SIS (e.g. A, B, 1, 2). Legend (optional): Enter the conduct grade, work habits grade or comment (e.g. Satisfactory, Needs Improvement, A pleasure to have in class). Current Values: Teacher View: A preview of how teachers will see this column. You may reorder the comments and, if desired, make value the default choice. Save and Back when finished. Continue setting up columns until finished and then click the Return to Grade Export Setup button. Choosing a default value for conduct and work habits can save teachers time when exporting grades. 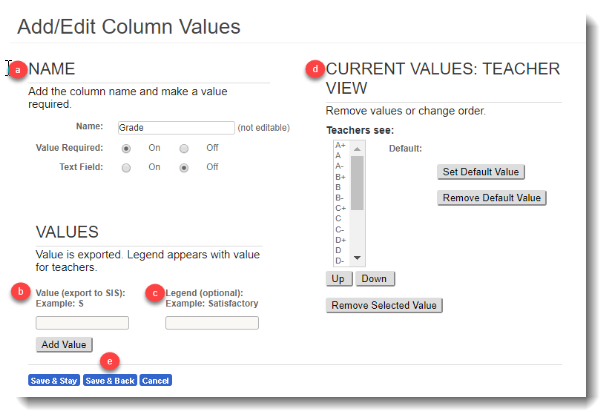 If a column is required, teachers may not export until a value is chosen for all students. Once you've completed the column setup, you may export your settings to a text file. This settings file may be used to quickly configure another school or to create sets of alternate settings. The grade export system contains the most common columns used by the Student Information Systems we support. If your SIS contains columns that are not included here, we may be able to add a custom column for you. If you are using Aeries SQL or PowerSchool, and your school uses variable credits, we can add this column for you. It can be a pull-down menu containing the values you specify, or it can be a text field so teachers can enter any variable credit value they want. Contact School Loop if you want to add a custom or variable credit column. For schools that require and can support multiple grade columns, our Grade Export System allows additional fields to be gradebook loadable. For example, your school may require teachers to submit a 4th quarter grade and a final semester grade. 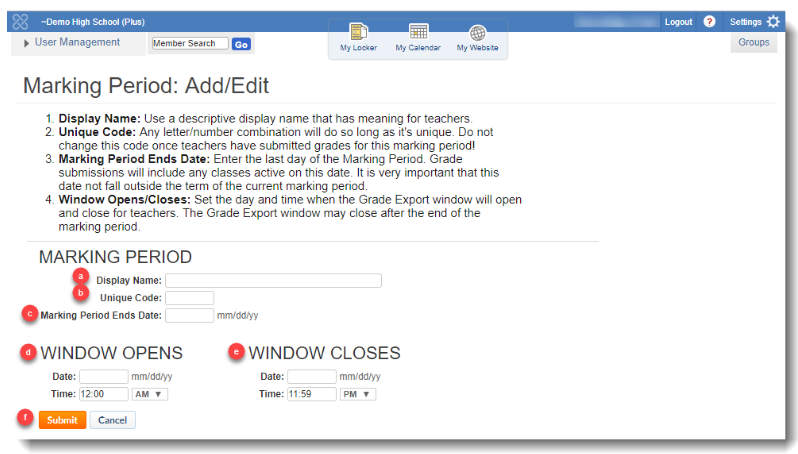 Teachers would be able to select the source of grades for each grade column, which then populates those grade columns with the letter grades from the selected gradebooks or progress reports. Contact School Loop if you want to make additional columns gradebook loadable. 1. Click the Grade Export Settings under the Toolbox and choose Export Status/Create Import File. 2. Click Create Import File. Teachers who have submitted grades are listed in the right column. The left column lists teachers who have not yet submitted grades. Click the envelope icon to send a reminder email to one or all teachers who have not submitted grades. 3. 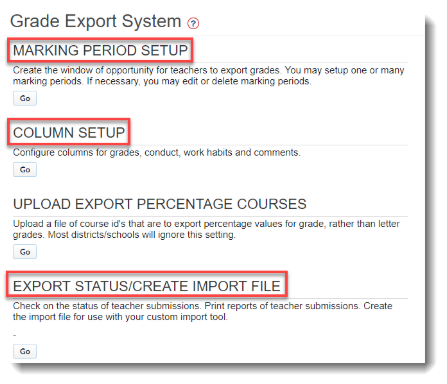 Select the marking period for which you wish to export grades. Only current or past marking periods will appear in this list. 4. Select all the teachers whose grades you wish to include in the export file. 5. Click the Create Import File button to save the import file on your hard drive. You may change the file name, but do not change the extension (slgrd or csv). As an option, you may check the box next to Remove +/– From Grades before creating the import file. Confirm your customized settings by clicking on Create Import file. (based on the last steps above) to download a copy of the file. The file can be opened on a notepad or spreadsheet.